June 03, 2002, L Crabo & J Troubridge..
Hyalophora euryalus is a very large red-brown moth (FW length 43–67 mm; expanse 7.4–12.7 cm) with pale lines and long crescent-shaped hindwing discal spots that flies in forests in all but the most eastern and northern reaches of the Pacific Northwest. The forewing is chestnut-brown in the median area, redder at the base, rose-pink dusted with variable gray in the subterminal area, and pale tan near the margin. Two oval black spots are located near the apex of the forewing, and the adjacent wing is purplish gray, rose, and white. The antemedial and postmedial lines are black bordered by white. The antemedial line is located near the base of the wing and is laterally convex. The postmedial line is straight perpendicular to the trailing margin. The subterminal line is black, smoothly waved. The hindwing is similar, but lacks an antemedial line and the markings near the outer margin are more complex with tan lines surrounding spots of the ground color between the veins. The discal spots are black filled with white. The forewing spot is relatively small, but the hindwing spot is very long, like a boomerang or upside-down Nike Swoosh logo. The underside pattern is similar, but the ground color is wood brown, not reddish. The head and most of the thorax are dark red-brown, while the collar is pure white. The antennae are quadripectinate, very wide in males. This species can be recognized easily in most of our area because of its red-brown color and elongate hindwing discal spot. 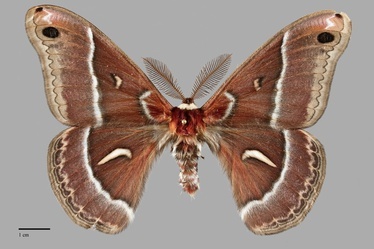 It resembles Hyalophora gloveri which occurs only in the eastern part of the Pacific Northwest. 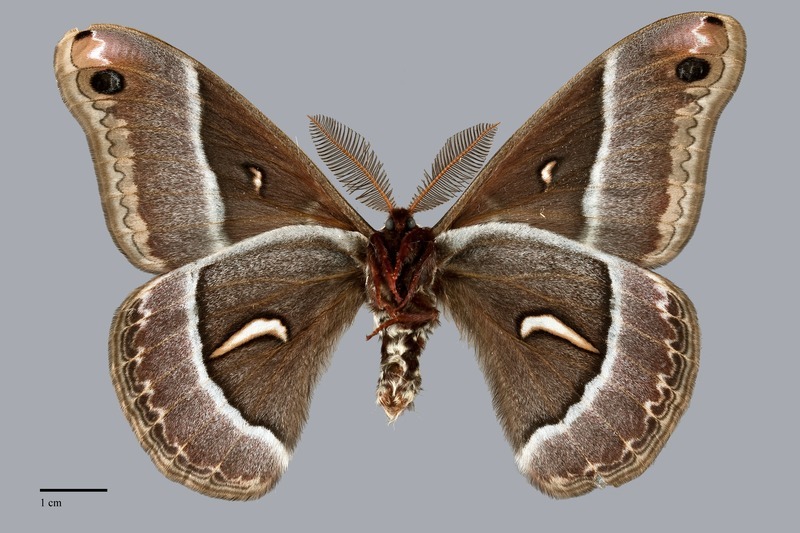 Hyalophora gloveri has gray instead of rosy pink distal to the dorsal forewing postmedial band, and its hindwing discal spot is shorter and more kidney-shaped than that of H. euryalus. Ferguson (1972) indicates that there is some overlap but that most specimens can be differentiated by these characters. The type locality of the synonym Samia rubra kasloensis Cockerell is Kaslo, British Columbia. The populations from this part of southeastern British Columbia are intermediate between H. euryalus and H. gloveri in some features, suggesting that has been some hybridization between these taxa in this region. This has been discussed by several authors, including Tuskes et al. (1996). Larva is green with round orange thoracic scoli or tubercles and longer white abdominal scoli. It is illustrated by Miller and Hammond (2003). This species is common and widely distributed in both forests and arid rangelands at low to high elevations throughout the Pacific Northwest. These habitats include coastal rainforests, mixed hardwood forests, riparian areas, montane forests, juniper woodlands, and even sagebrush steppe. 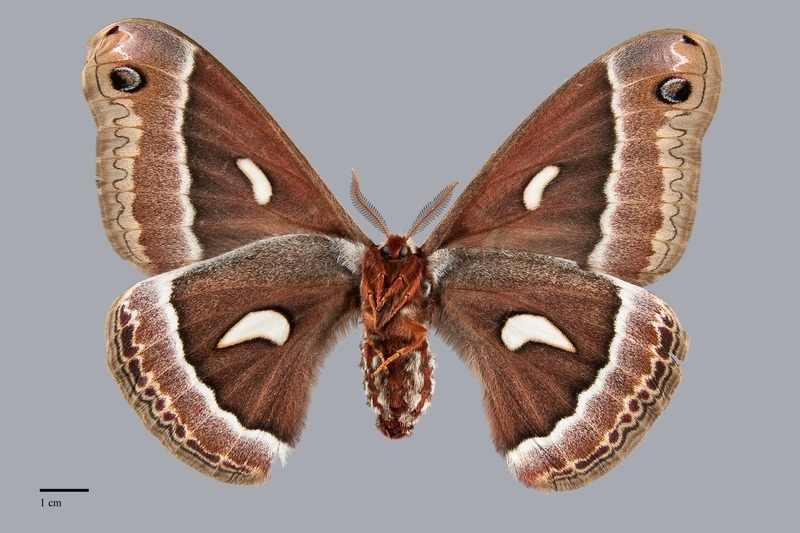 Hyalophora euryalus is found in forests and higher rangelands throughout most of the Pacific Northwest. The range extends north to south-central British Columbia to the latitude of Quesnel and east to western Montana. This species is replaced by H. gloveri in the far eastern and southeastern parts of the Northwest. This species has a West Coast distribution. Outside the Pacific Northwest the range extends through all but the southeastern portion of California to the Baja Peninsula of Mexico. The larva of H. euryalus is a generalist feeder on a wide diversity of woody shrubs and trees including Douglas fir (Pseudotsuga menziesii) in the Pinaceae, snowbrush (Ceanothus spp.) in the Rhamnaceae, various Rosaceae such as cherries (Prunus spp. ), willows (Salix spp.) in the Salicaceae, and various shrubs and trees in the Ericaceae and Betulaceae. In juniper woodlands and sagebrush steppes east of the Cascades the favored foodplant is bitterbrush (Purshia tridentata) in the Rosaceae. The adults of H. euryalus are on the wing from late spring to mid-summer. Pacific Northwest specimens have been collected from April to early August, with most records from May and June. It is nocturnal and comes readily to light. The moth rests with the wings folded over its back like most butterflies. Like other giant silkworm moths they do not feed as adults.